The more time we spend in the countryside, the better we feel. This is something researchers the world over agree on. The richness and intensity of nature in Dalsland is unparalleled for anyone in search of a generous dose of revitalisation and well-being. Welcome to a region that offers sensory experiences that go well beyond the norm! 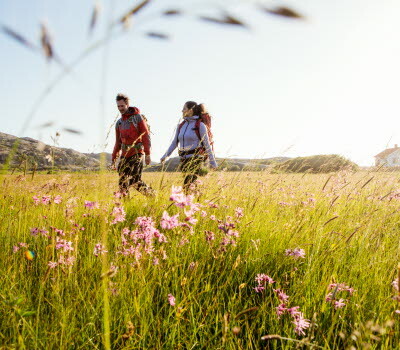 Have you at any time wondered why you feel so good when you’re in the countryside? The answer is perfectly simple. You feel good because essentially it is where you belong. Hundreds of thousands of years ago everyone lived outdoors. With the passing of time, we got it into our heads that we should build towns and live indoors. But our senses are still attuned to living in the heart of nature, which is the main reason why nowadays we are more stressed than ever. 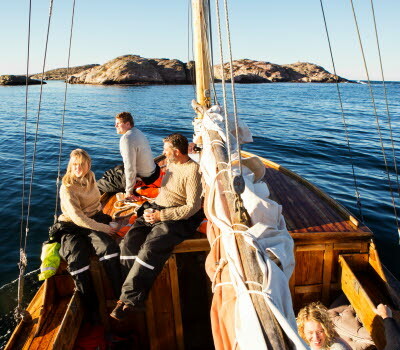 Dalsland is located in the northern corner of West Sweden, with Norway and Bohuslän as neighbours to the west, and Lake Vänern – the largest lake in Sweden – to the east. 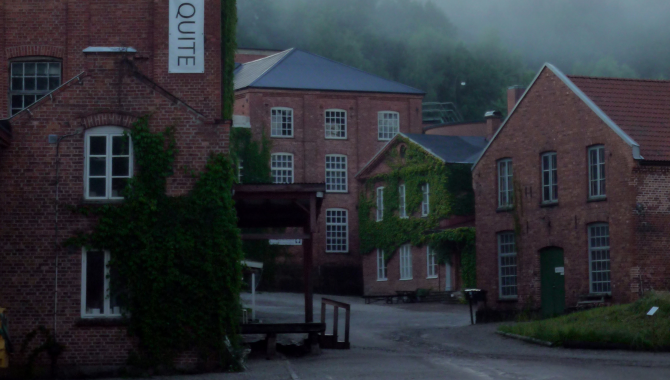 In less than two hours by car from Gothenburg and Oslo you can immerse yourself in soothing, tranquil countryside. 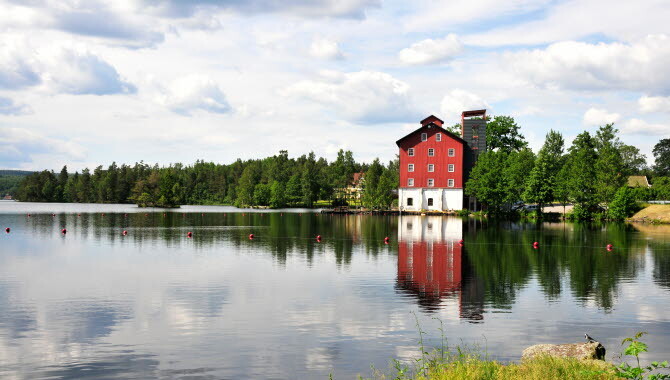 What you will be struck by in particular is how varied the natural surroundings are in Dalsland, with everything from mountains and idyllic forests to expansive plains, an exciting coast and countless lakes – all with a rich and varied array of flora and fauna. This was what in all probability induced Prince Eugene, at the end of the 19th century, to describe Dalsland as Sweden in miniature. It is this diversity that opens up such a vast range of breathtaking, exquisitely picturesque options. But don’t feel stressed by the choice. 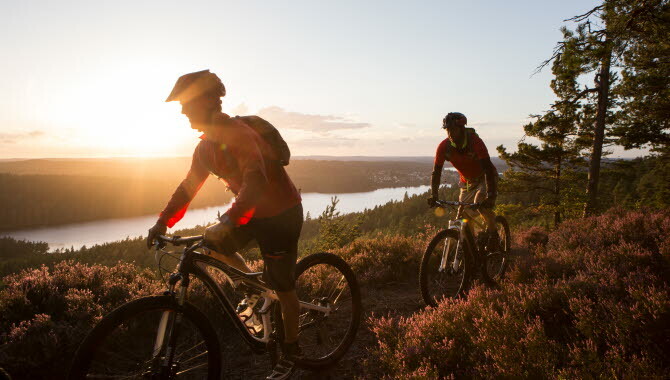 We can help you on your journey of discovery by presenting our 10 best tips on what Dalsland has to offer. All you need to do is choose and enjoy! The 72 Hour Cabin health-promoting project offers you the opportunity to spend an unforgettable night in a unique glass cabin. Located deep in the countryside, the small cabins offer a sensational view across forests, lakes and star-filled skies. 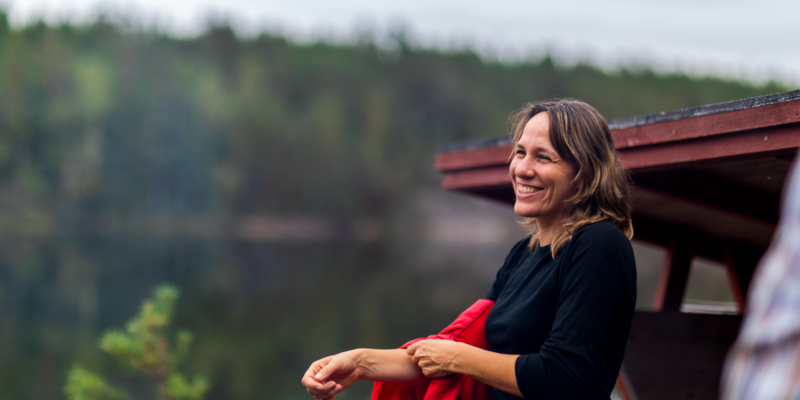 The stress and strain of daily life will melt away swiftly as you gradually uncover everything that Dalsland has to offer. 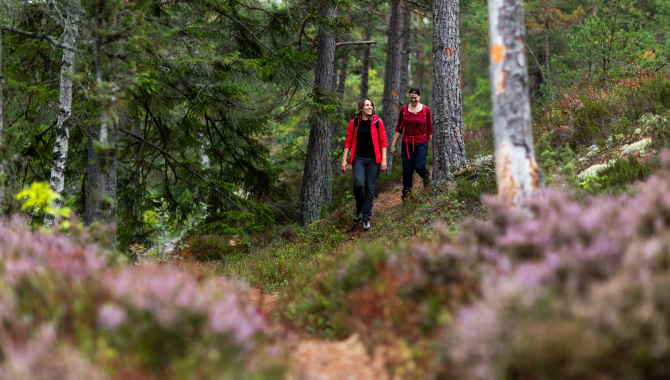 Following the Pilgrim Trail in Dalsland is a way of stepping out into and discovering the wild and beautiful rural landscape. Along the way you pass numerous settings with historic links – from ancient dry-stone walls and the foundations of smallholders’ cottages, to enchanting 13th century churches. The most enjoyable and uplifting part of the trail runs from Upperud to Edsleskog. 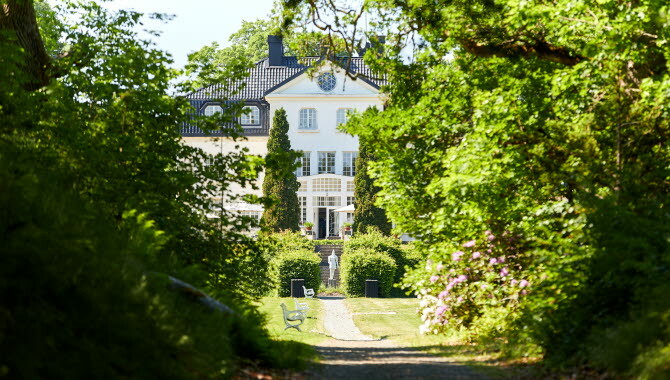 Located on a lush peninsula in Lake Laxsjön is Baldersnäs Herrgård, offering almost everything we associate with modern life in a country manor. Symmetrical wings, a park ideal for walking, excellent food, a generous wine cellar, spa and yoga facilities, a woodfired hot tub, a sauna at the edge of the lake, riding, canoeing and golf. And a great deal besides. A cultural centre, a cultural collective, or simply a creative space. Regardless of how you choose to describe Not Quite in Fengersfors, it remains a place that leaves no one unmoved. Every little corner of this old rustic mill is filled with creative works of art. A vibrant cultural mecca in a setting that appeals to our senses in every form and on every level. 11% of the area of Dalsland is covered by water, making it the province in Sweden with most lakes. Not particularly surprising then that canoeing and kayaking are popular pastimes. Clean air, fresh water, an abundance of plant and animal life and numerous places to shelter from the wind or camp for the night. You can’t get any closer to nature! The Dalsland Canal is regarded as one of the most beautiful canals in Europe thanks to its natural lake system. In 2018, it celebrates its 150th anniversary. 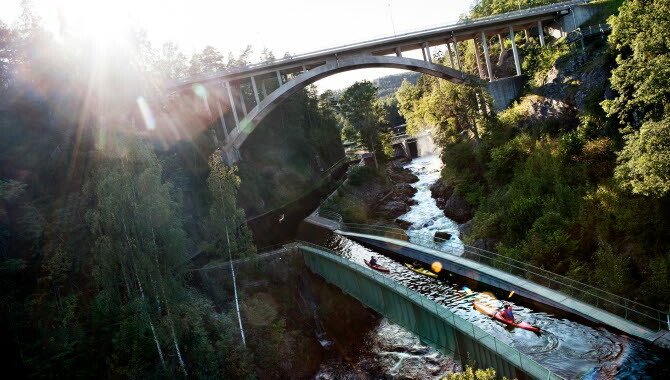 The canal’s, and perhaps the whole of Dalsland’s, most spectacular section is the aqueduct at Håverud, a well-known meeting point that brings together waterway, railway and road. How does staying in a 100-year-old former grain silo that has been lovingly transformed into a stylish boutique hotel appeal to you? 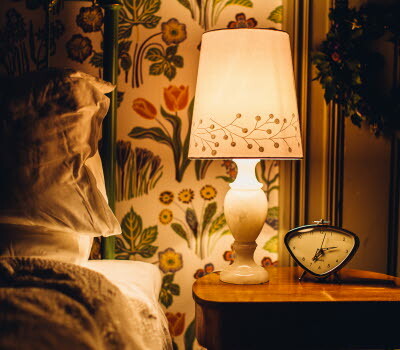 The rooms at Upperud 9:9, with their distinctive Scandinavian design, have been beautifully incorporated into the historic structure, with French balconies that allow you to take in the captivating view across the water and experience the light to full effect. And the odd grain of wheat or rye is almost certainly still hidden away in the gaps between the planks. The Japanese forest therapy tradition of Shinrin-Yoku means “taking in the forest atmosphere using all your senses” or literally, “forest bathing”. Half an hour in the forest is enough to bring down your stress level, blood pressure and heart rate. Spend a whole weekend in the forest and your immune system will receive such a boost that it will keep you going for at least a month. 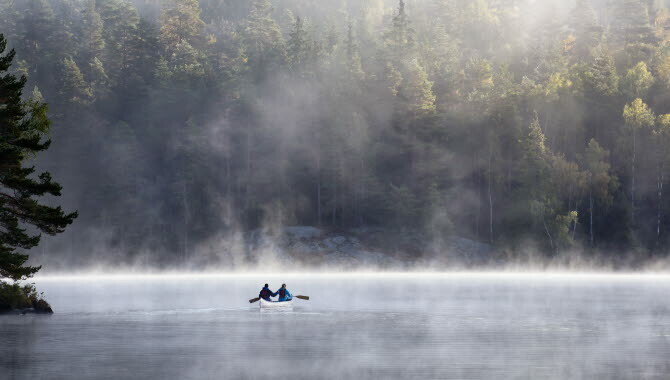 The dramatic wilderness in northern Dalsland bears witness to a time when the area was dominated by inland ice. And in the heart of this patchwork landscape of rift lakes, elongated ridges and marsh-clad valleys, a vast network of captivating trails and tracks extends in every direction. Ideal for everyone who appreciates true adventure on two wheels! In Dalsland there are deep, ice-cold lakes, small forest tarns, and numerous shallower, nutrient-rich lakes and watercourses. And there is of course Lake Vänern. 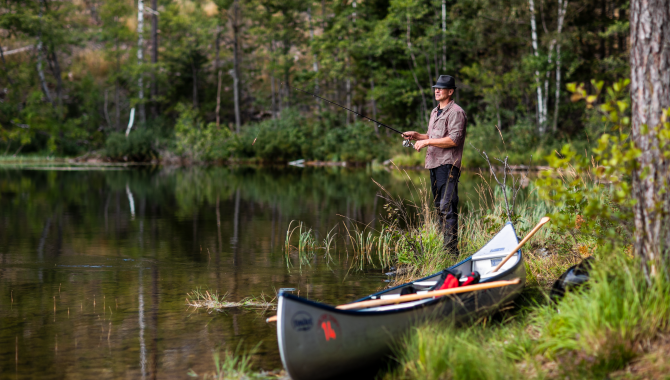 Species such as perch, pike, freshwater salmon, burbot, rainbow trout, char and salmon trout all thrive here. Perfect conditions regardless of whether your preference is for angling, spinning, line fishing or fly fishing. As you may have noticed, nature is central in Dalsland. 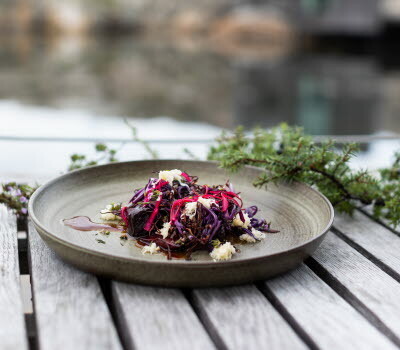 Accompany us to the outdoor pursuits and activity centre Dalslands Aktiviteter for a true adventure, or embark on your own personal and exciting journey of discovery. Welcome to Dalsland. Welcome to nature.